Today I put the finishing touches to the quilt I’ll be exhibiting at this year’s Festival of Quilts in Birmingham. Anyone who has exhibited a quilt before will know that these preparations include the addition of a hanging sleeve. In the past, I have made my own hanging sleeve (essentially a tube of fabric attached to the quilt back that allows a hanging rod to be inserted). Nowadays I don’t bother making my own. Instead I use a ready-made quilt hanging sleeve called Quilters Hangup. I first came across Quilters Hangup last year and I love them. They are made from a sturdy cotton fabric and come in a natural unbleached muslin (this in the one I use) and black. Pre-made to the regulation 4 inches tall, the Quilters Hangup also includes a pleat at the top edge that allows quilts to hang flat! And the rainbow thread on the back is a pretty touch. Quilters Hangup may not be the cheapest option however they do save a lot of time. Simply cut to length and hem the ends. There is enough in each pack to make a hanging sleeve for even the largest Super King size quilt. 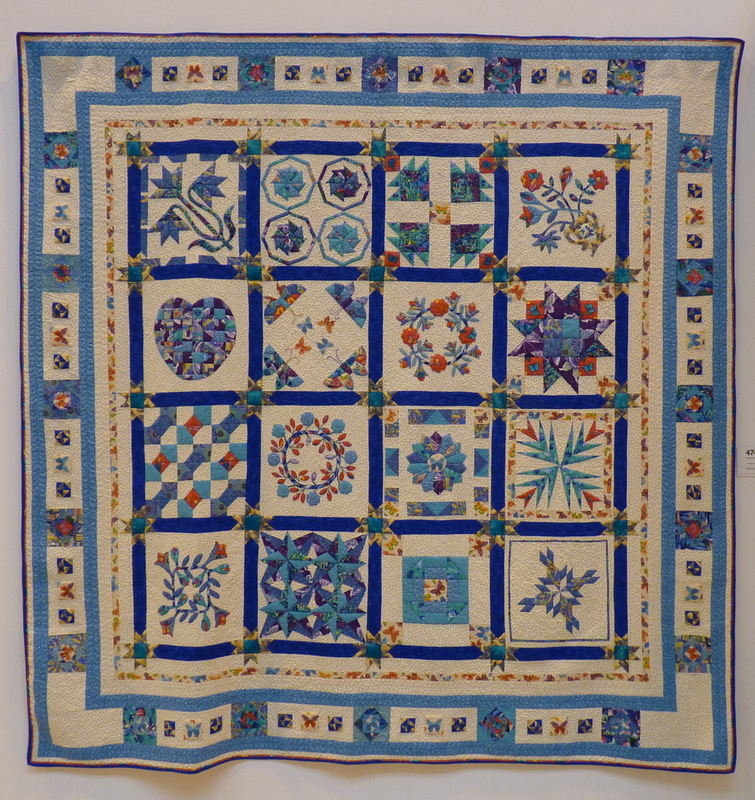 Quilters Hangups can be sewn into a quilt before or after sewing on the binding. 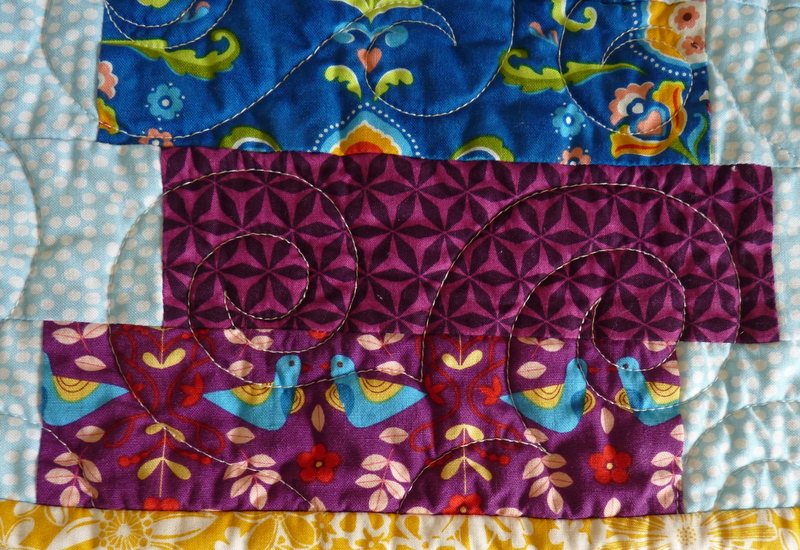 I prefer to hand sew my Quilters Hangup to the quilt after binding. My quilts are made to be used rather than hung on a wall, so it is essential that I can easily remove the sleeve. Plus making the sleeve removable means that I can re-use the hanging sleeve when exhibiting other quilts the same size. I’m sure Quilters Hangups are readily available in America as they are a USA product. For those in the UK, I purchased mine from Sew Hot. 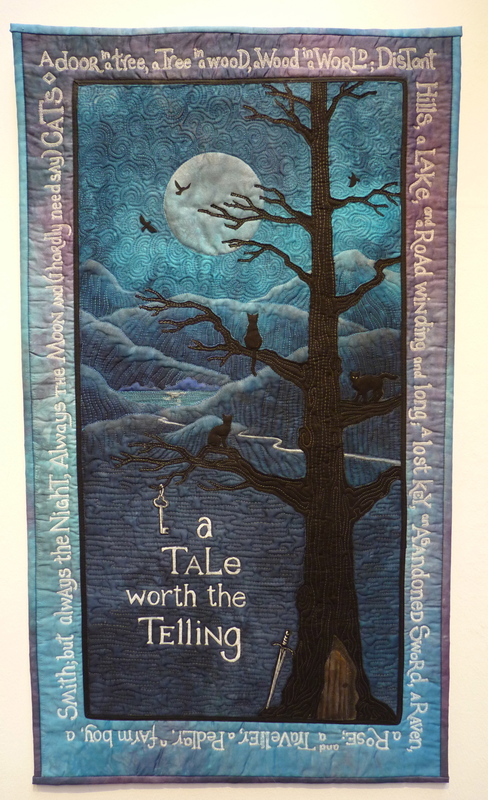 Here at last is the quilt that I exhibited at the recent Festival of Quilts held in Birmingham. It is called Memories of Childhood because I felt the little fabric pictures perfectly capture the joy and innocence of being a child. 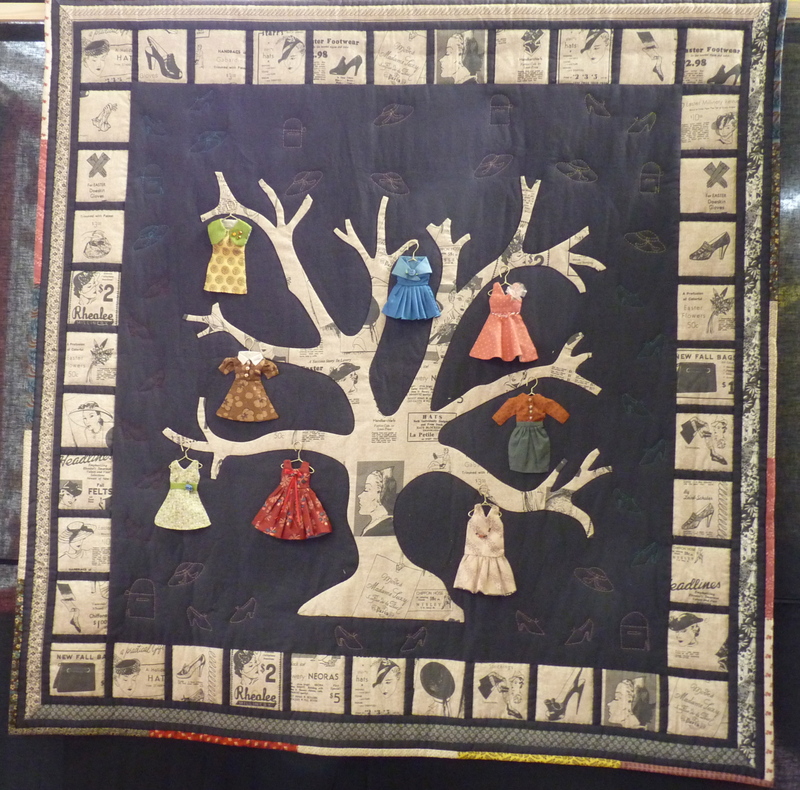 With over 80 different fabrics used for the Polaroids, there is so much to discover in this quilt. 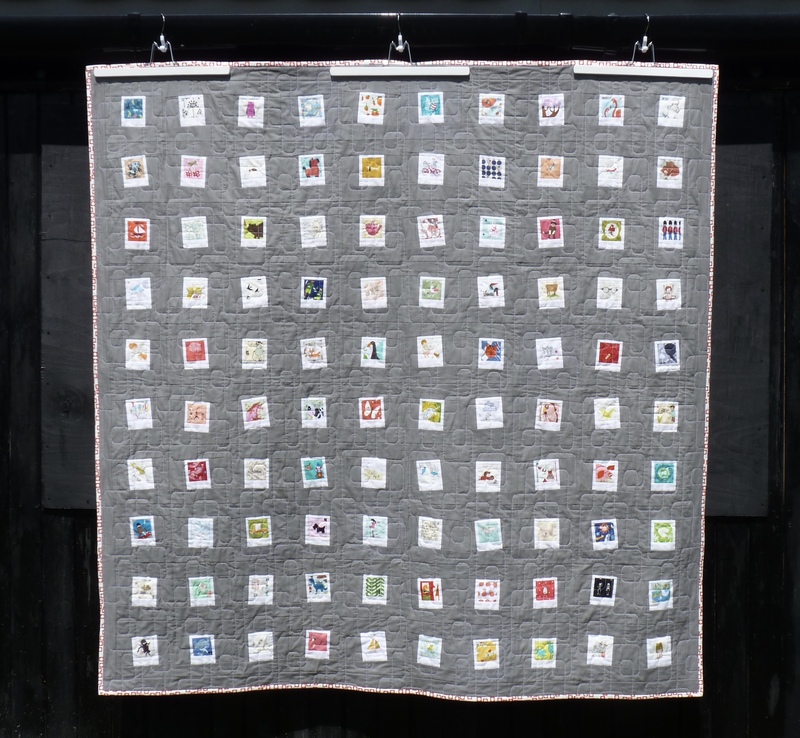 One hundred Polaroid blocks are featured in the quilt and no picture is repeated. There are birds, wild animals, cats, dogs, insects, boys and girls playing, mythical beasts and much, much more. This “Blast Off” block even glows in the dark! You can see more detail In an earlier post of some of the Polaroids before they were pieced into the quilt. All the blocks are tilted to give the impression that the Polaroids have been randomly strewn across the quilt. I love these Polaroid blocks. They make a great i-spy quilt for rainy day games. And imagine the stories you could make up with your children using these little blocks as inspiration. 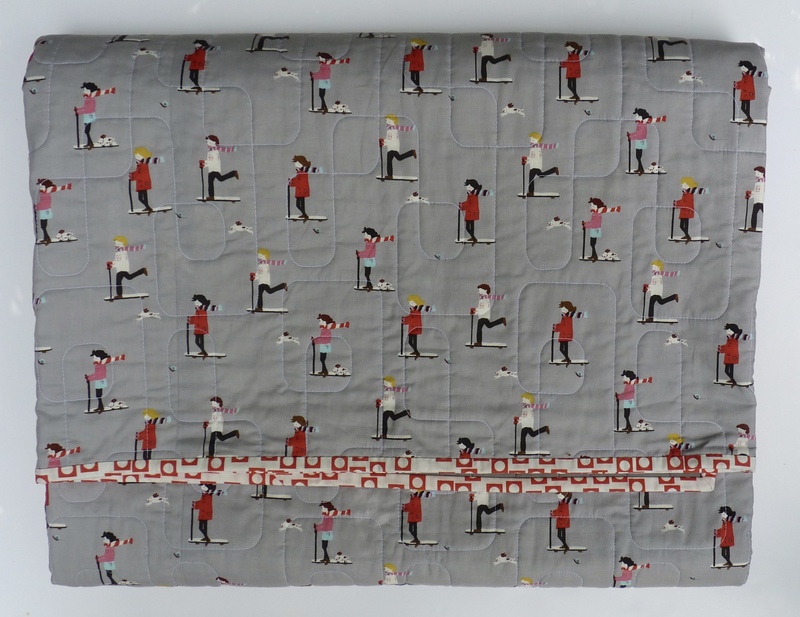 The back of the quilt is just as lovely, featuring this fabulous print of scooter boys and girls by Aneela Hoey. It has been carefully pattern matched for a seamless finish and the red and white binding (also by Aneela Hoey) frames the quilt beautifully. At 61 x 62 inches (155 X 157 cm) it is the perfect size for picnics, cuddling on the sofa, a cape, a den, a bed or thrown over a chair. 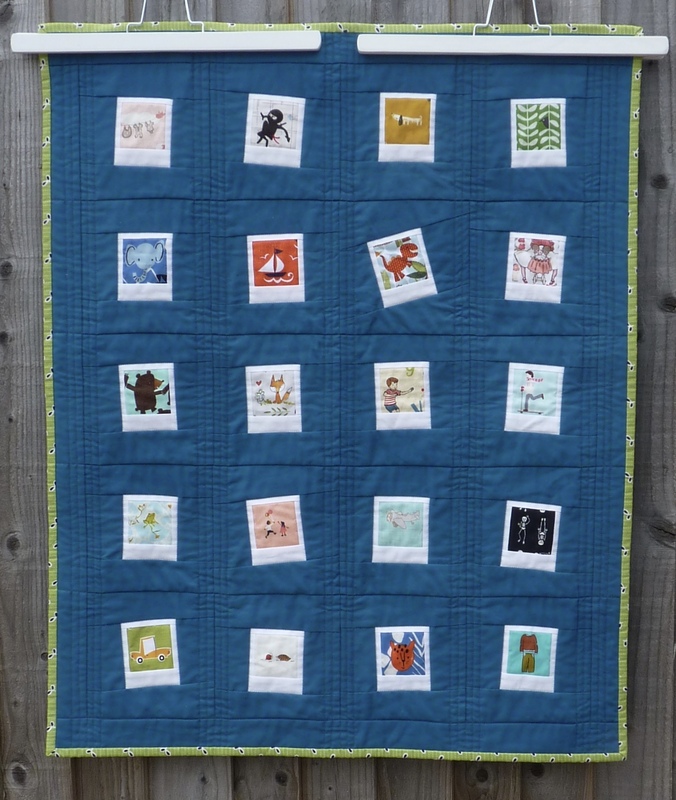 The quilt is made from high quality 100% cotton quilting fabrics, wadding and thread and has been professionally long-arm quilted (the pattern is called cool beans) to make it sturdy and durable. 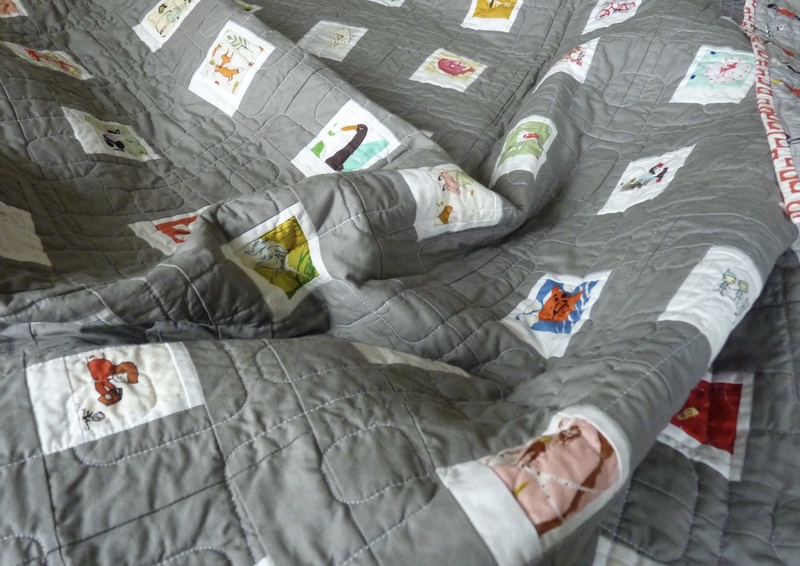 Warm and snuggly, this is one of my favourite quilts. Definitely one to be played with now and a treasured heirloom for the future. I’ll be listing it for sale via my Folksy shop very soon. 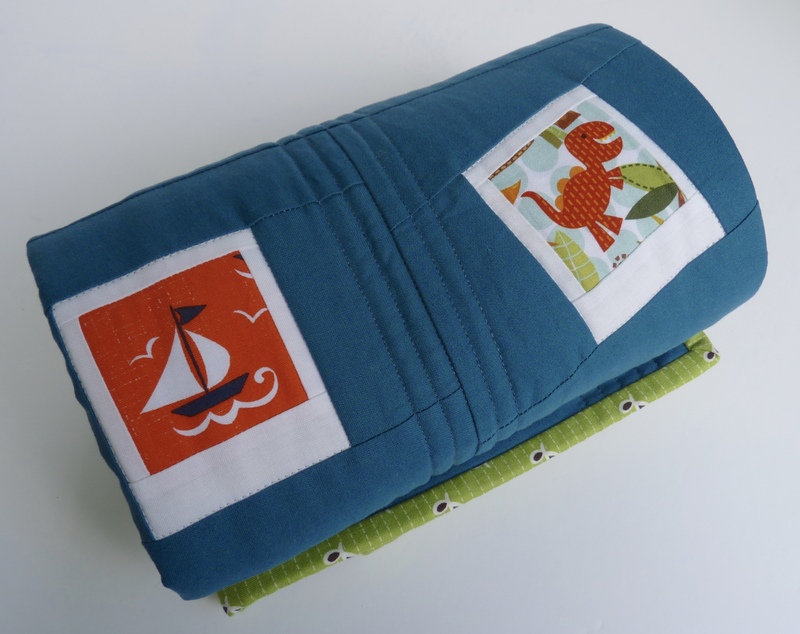 A new baby calls for a very special gift and what could be more special than a gorgeous baby quilt. My latest obsession is definitely Polaroid blocks. 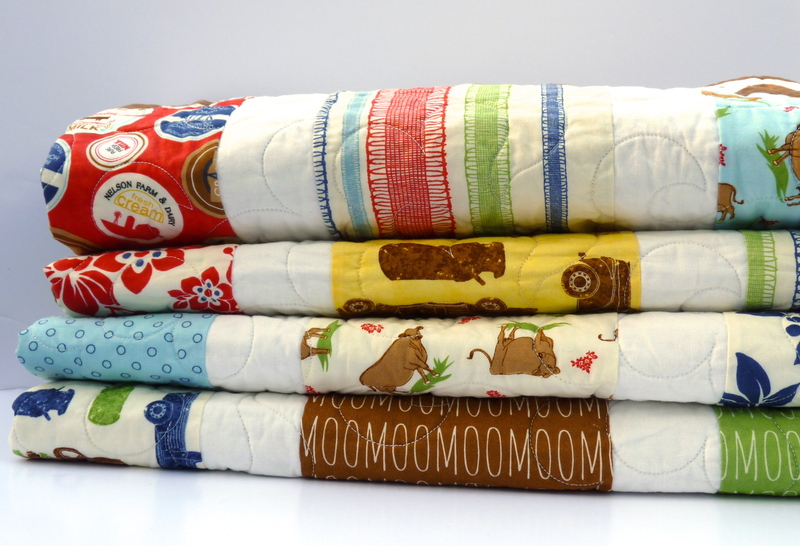 I love them and don’t they make a fabulous baby quilt? Here I have fussy-cut my favourite fabrics to produce a quilt perfect for the new man in your life. Each of the blocks has then been cut to make them slightly wonky, as though the Polaroids have been tipped from a box onto the quilt. There is so much to discover in this quilt. You’ll find a boy riding a scooter, a fierce ninja, a tiny snail, a cute dachshund. There is a crow peeking from the bushes, some ghoulish skeletons and my favourite, a scary tyrannosaurus (RAWWRR!). 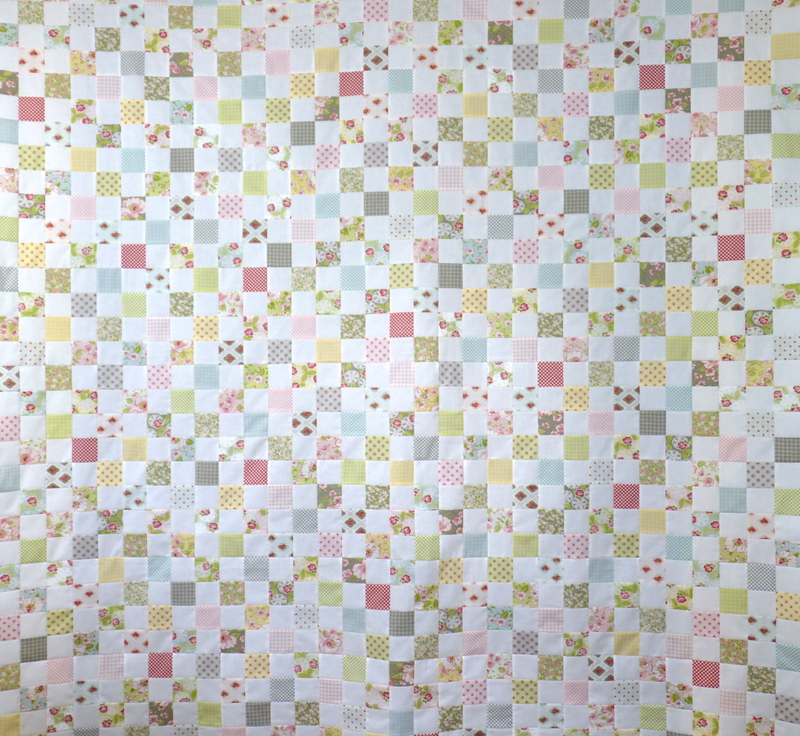 This little quilt, being approximately 27 by 32 inches, is the perfect size for a baby. It is soft and supple and therefore great for cuddling baby. 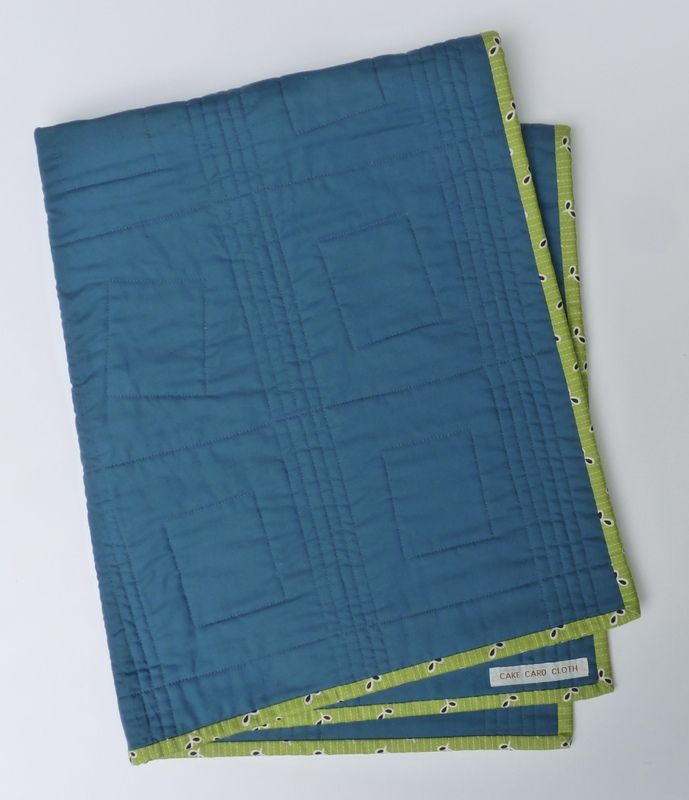 It can also be a play mat, changing mat or pram blanket when the baby is little. Even better, it can be folded and rolled small enough to fit into a bag so the quilt can go wherever they go. Once your baby boy gets a bit older, the Polaroids will make for fun games of i-spy or for story-telling. Use it as a wall hanging, as a colourful addition at the end of their big bed or thrown over a chair. The backing in Kona cotton teal looks great against the binding – a sweet seedling print by Denyse Schmidt. Being made from 100% cotton makes this quilt so easy to care for. Just give it a short, cold machine wash and dry it flat in the shade, or pop it in a dryer on a low setting. It will come out as good as new. This quilt will make a wonderfully versatile and practical gift for any baby and will soon be available via my Folksy shop. Like what you see? Remember you can follow me on Facebook, Instagram and Pinterest to see more lovely makes. Start with a couple of charm packs (I used Moda’s Regent Street lawn) and two metres of a solid fabric (I used Bella Solid in off-white). Cut the solid into 124 individual 5 inch squares. Sew the charm squares and solid squares together randomly into 16 rows with 13 squares in each row. Then sew the rows together. As you can’t always find a fence tall enough I had to photograph the finished quilt hanging sideways. The quilt is 72 inches by 58 inches which is easily big enough for a single bed or as a large throw for the sofa. Here is a close up showing the backing and detail of the quilt. 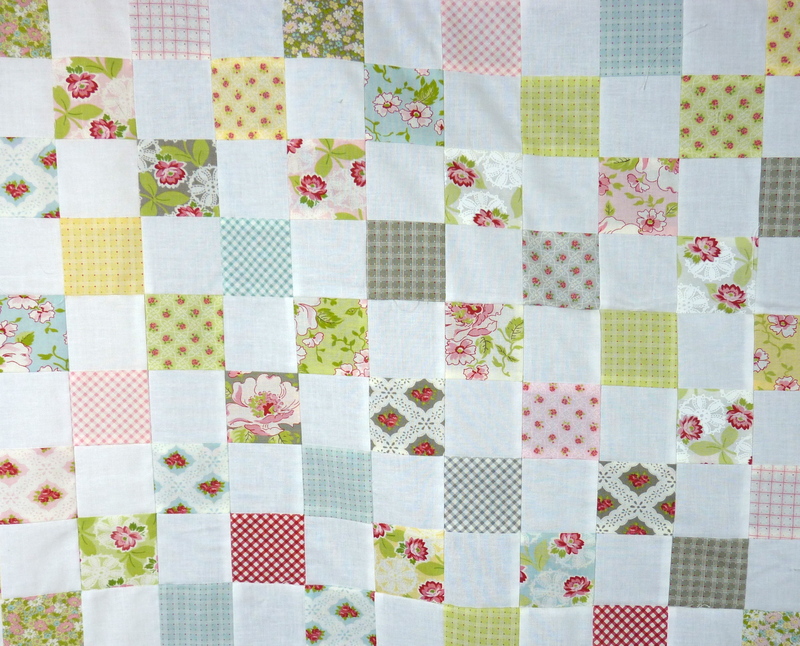 The lawn fabric is beautifully soft and silky giving the quilt a luxurious feel. And the long arm quilting in Curlz adds a lovely texture. This quilt design is based on the Lazy Daisy pattern by Jeni Baker. It is a easy, simple pattern that is perfect for beginners. 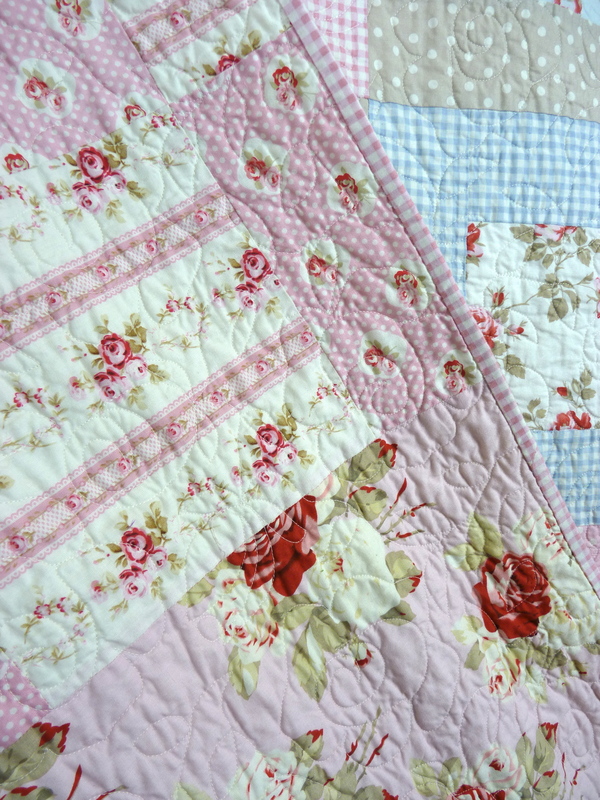 Fabric designs featuring large roses and pretty, soft colours make the perfect choice for a country cottage style quilt. 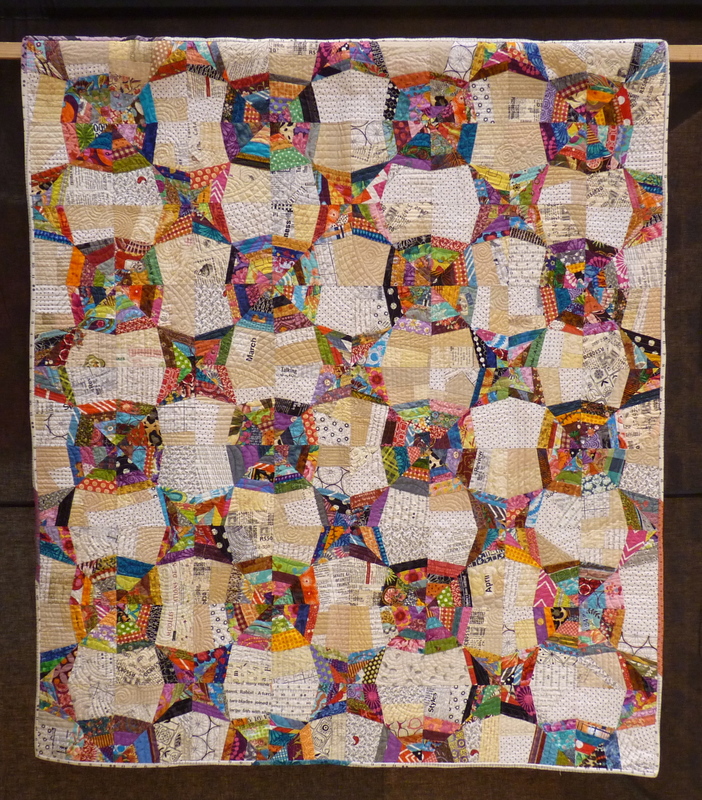 This is a quilt I made some time ago using Tanya Whelan’s Petal collection (sadly no longer available). The colours appear sun bleached and summery whilst the overblown roses are reminiscent of warm afternoons relaxing in a country garden. For the piecing, I chose an upscale version of a pattern appropriately named “square in a box”. There are lots of variations of this pattern however I kept it simple with a large centre square framed in either a spotted or checked fabric. 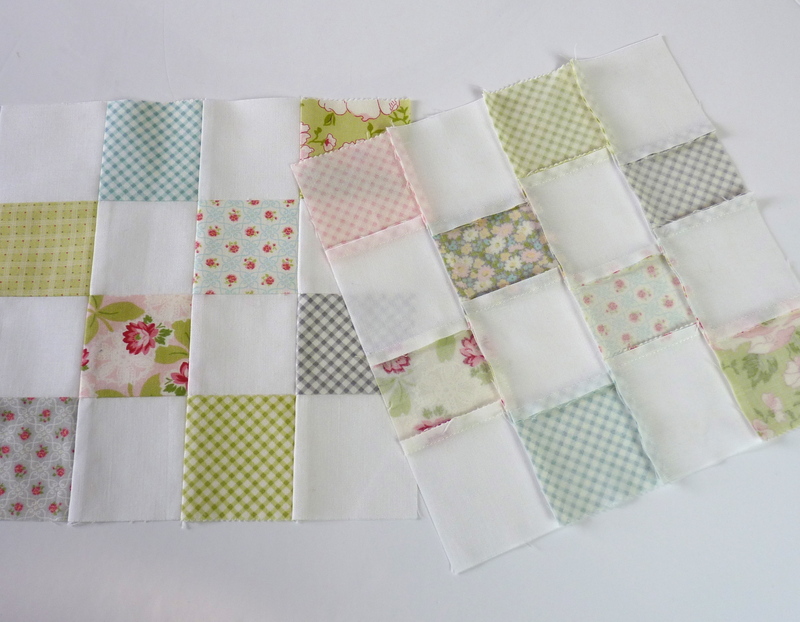 The layout I chose alternates between blocks framed in spotted or gingham fabrics. Initially I alternated the two rose designs too however I quickly changed that to a random placement of the centre roses. Symmetrical layouts really are not for me. The quilt was long arm quilted using a dense pattern of open roses. It is a little difficult to see in this photo however I think you can make out one of the roses in the gingham square. 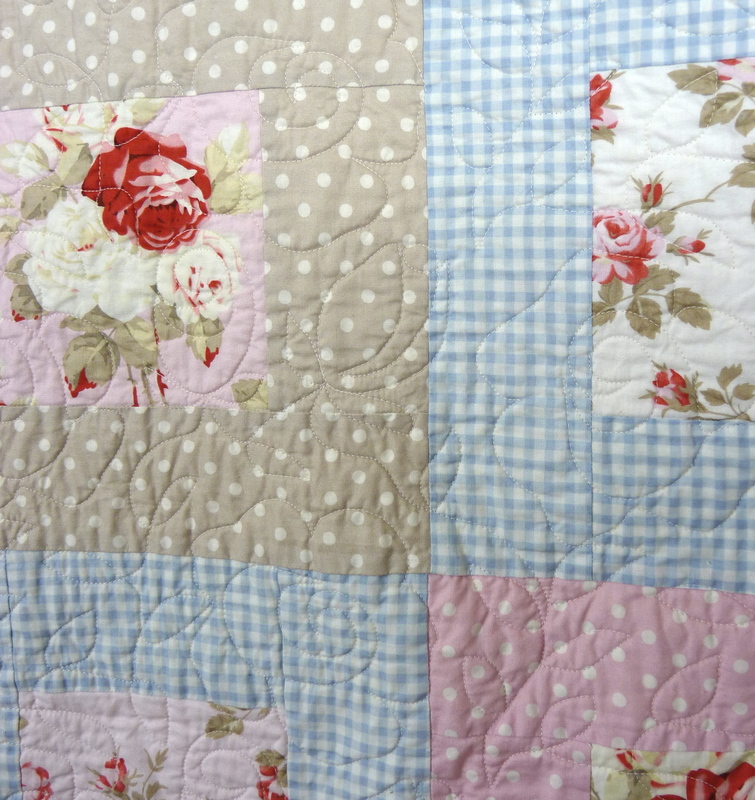 In keeping with the country style of the fabrics, I made a pieced backing for this quilt featuring the large roses and two smaller rose designs not used on the front. The pink gingham fabric makes a charming binding to finish. 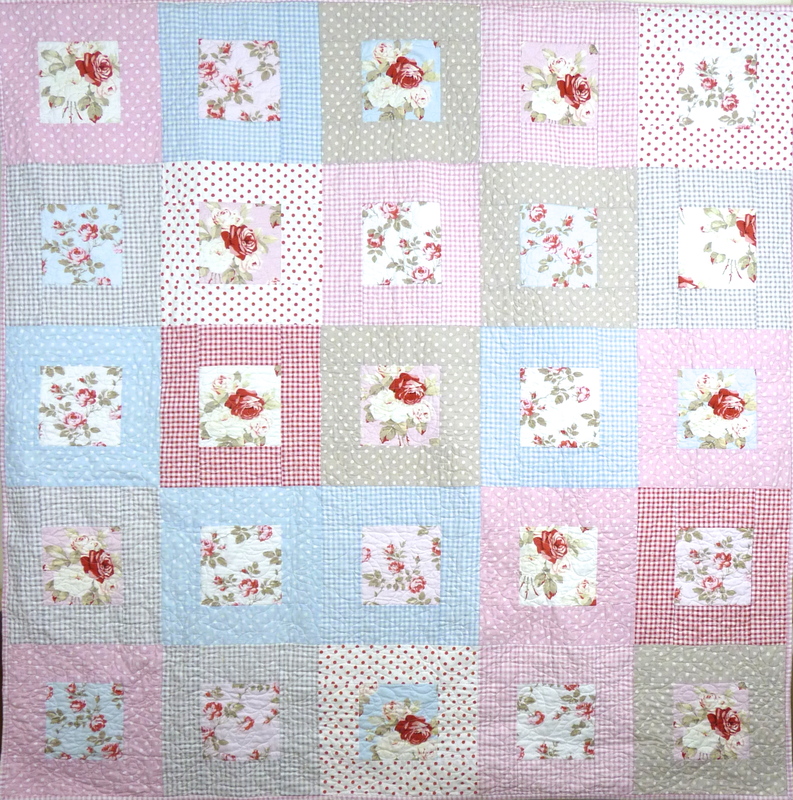 This quilt has been washed to achieve that lovely vintage crinkly appearance and is made from 100% cotton fabrics, thread and wadding. It will be on display at my Bucks Open Studio event in June. I’d love to see you if you are able to visit. Over the next few weeks I’ll be sharing details of more of my quilts that will be on display in June. Remember you can also follow me on Facebook, Instagram and Pinterest. I look forward to seeing you there. What do you give someone when you want something that says “you’re special”, something that says “thank you”, something that says “I love you”? For me, the answer is usually always a handmade quilt (sometimes it is cake but that is another story). Earlier this year, it was my privilege to make a custom order quilt for a couple who have a jersey cow stud. 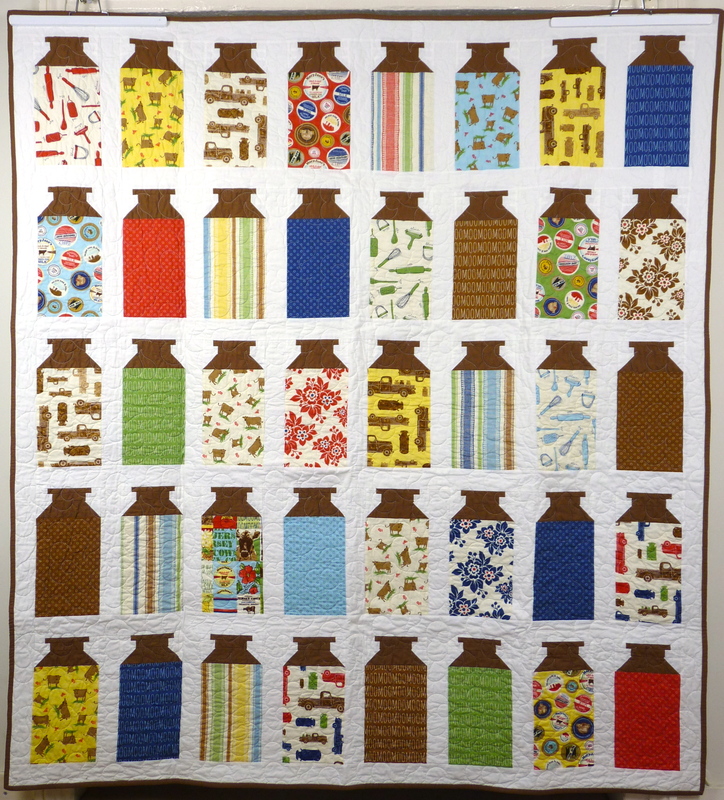 When I showed my client a fun quilt pattern featuring rows of milk churns (remember those?) we knew we’d found the perfect design. I mean, dairy farmers and milk churns, what could be more appropriate? The fabric collection is Milk Cow Kitchen by Mary Jane Butters for Moda. Nostalgic, a bit kitsch, the collection features tiny jersey cows, vintage cars, kitchen utensils, milk bottle tops and my personal favourite, lots of moos!!. There is even a recipe for strawberry jam. To make the quilt I used this free pattern from the Fat Quarter Shop. I did change the pattern slightly by adding an extra column of milk churns to make it wider and I changed how I added the sashing. 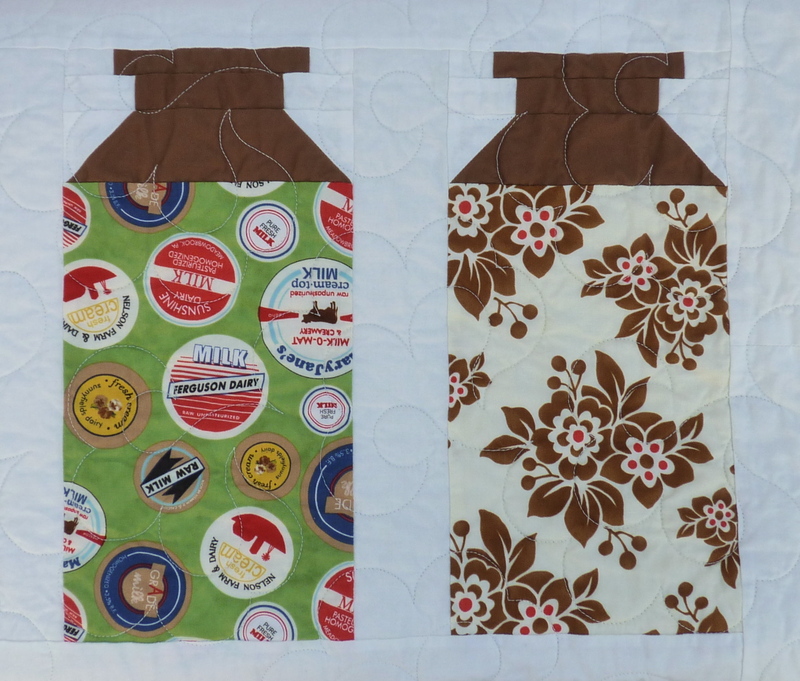 The milk churn lids were made as larger strips that are then cut down making it much quicker and easier to put together than it first looks. 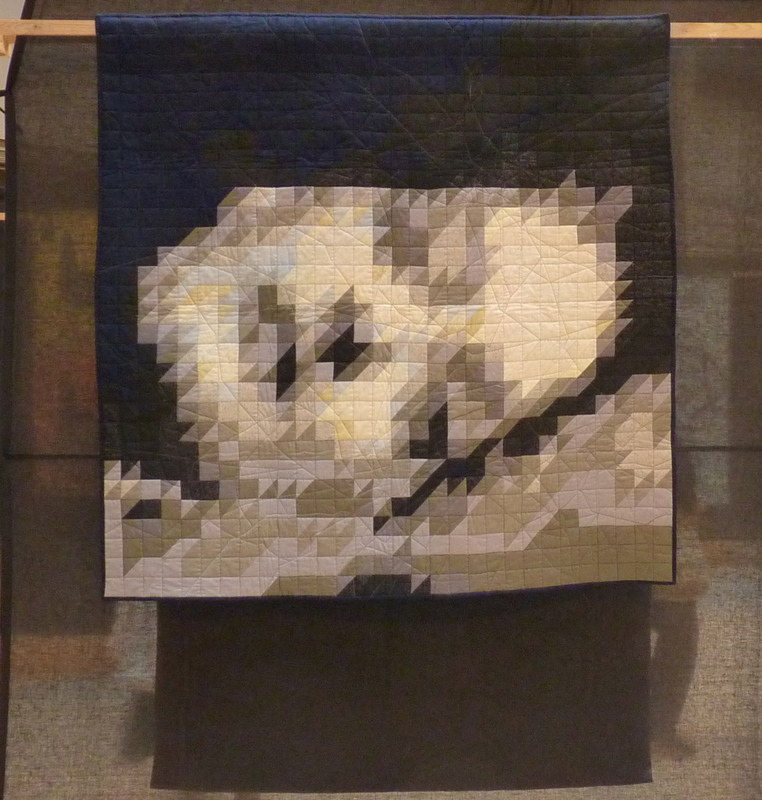 The finished quilt was professionally long-arm quilted with an overall pattern called Cloud Nine. And for the backing, I chose this green Lulu fabric from the Up Parasol range by Heather Bailey. It is one that I wish I had been able to buy more of as it really is the most lovely light olive green. The 100% cotton wadding in the quilt makes it irresistibly soft and warm and gives the quilt a beautiful drape. At 70 inches by 64 inches, it is a very versatile size and perfect for a bed or a sofa. Today I received the good news that Royal Mail and Australia Post did their bit and delivered the quilt safe and sound to its new home. And I’m very pleased to say that it was a very welcome present that will be much loved for many years to come. A special gift for a lovely couple. 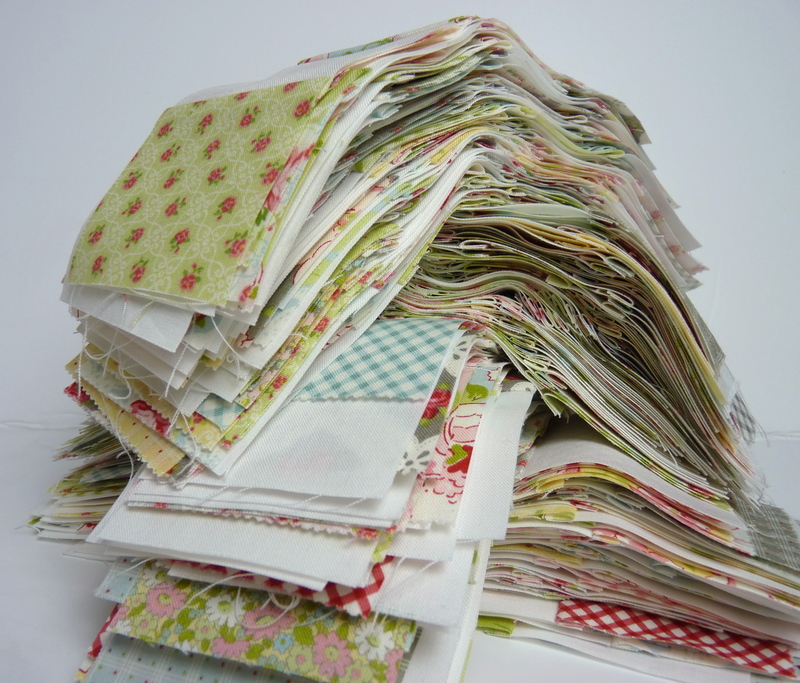 Strangely I seem to have a number of half-finished quilts cluttering up my workroom. I’m not sure how this happened. Best not to dwell on the how and instead focus on getting them completed. With this in mind, over the past week I have been working on a checkerboard quilt top that had been languishing on my dining room table for (many) months. I had decided to use a jelly roll for the patterned sections and then very quickly wished that I hadn’t. Don’t get me wrong. I love using jelly rolls. Sadly this one seemed to have more than its fair share of strips not cut on the grain and many were slightly wider than 2 1/2 inches. After a bit of judicious cutting, thankfully this wasn’t too much of a problem. 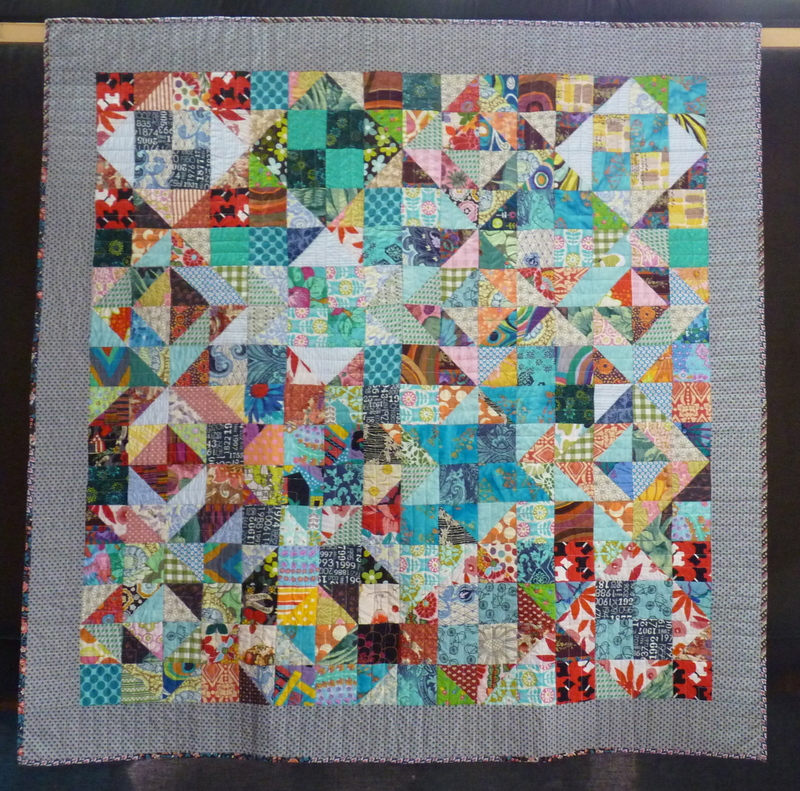 Rather than cut out individual 2 1/2 by 2 1/2 inch squares, I used this strip piecing tutorial by Red Pepper Quilts. I selected 33 strips from my jelly roll, cut them in half on the fold line and then attached a 2 1/2 inch wide strip of plain fabric to the long side. Although not really necessary, I cut the jelly roll strips in half to reduce any potential problems if the strips were wonky. I really needed only 32 jelly roll strips for the quilt. The extra one was to allow for any cutting errors (sad to say, there was one) and also ensured I had plenty of options when putting the quilt top together so that similar/same patterns weren’t right next to each other. The sewn strips were then cut down to 10 1/2 inches long and then sewn to another pair of sewn strips. Although these strips were slightly shorter than the 11 inches recommended in the tutorial there was more than enough fabric available when cross-cutting the strips. I worked on a quarter of the quilt at a time as I don’t have a large enough space in which to layout the full quilt design. Making up blocks of 16 squares each as per the tutorial made it much easier to nest the seams together and the reverse stayed very neat and tidy too. My quilt top is now complete and ready for quilting. I love the colours in this one. They are so soft and pretty. And the white squares make it look lovely and fresh. Here is a close-up so you can see all that prettiness in detail. It reminds me of meadow flowers strewn across a white sheet and I don’t even mind the greys in this one. Now I just need to choose the backing fabric and the quilting pattern. Decisions, decisions. Oh, and in case you are wondering, I used an Ambleside jellyroll by Moda – a very pretty, country cottage collection of rose, daisy, gingham and lace designs – and Bella Solid in Off White for the plain squares. Is there anyone who doesn’t love rainbows? They are so beautiful; a symbol of hope and a promise of better things to come. 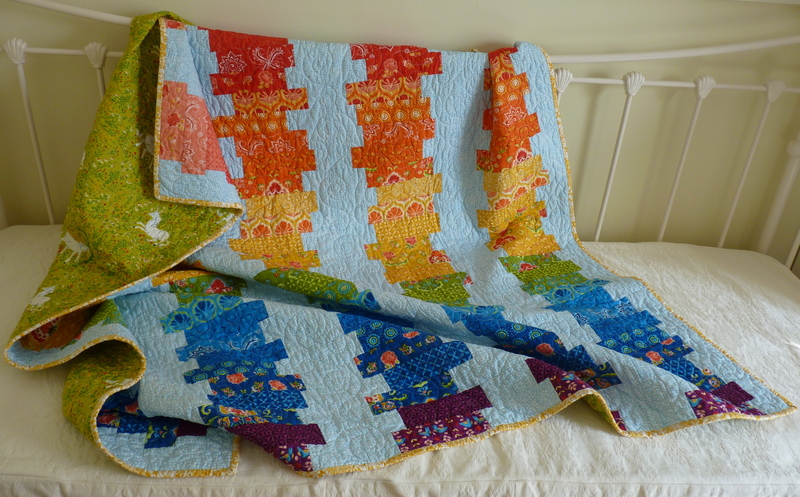 The beautiful colours of Fancy by Lily Ashbury simply lent themselves to a rainbow quilt. Even the press information about this collection described it as being like “rays of sunshine on a cloudy day” and “gorgeous, lush, and drenched with colour”. The collection was missing a purple so I hunted though my fabrics to find something suitable. This was harder than it might seem as purple, particularly a dark reddish purple, is not a common colour in quilting fabrics (they seem to tend toward lavender and bluish purples). Thankfully I found two. The sharks tooth is a fabulous match as the pattern mimics others in the Fancy collection. The second had little birds on it. At first, I wasn’t sure if this would really work with the other fabrics. But then I remembered that in the song, “happy little bluebirds fly beyond the rainbow” so it was obviously meant to be. The spectrum of colours made a coin quilt design an obvious choice for me. I had so much fun making my last off-set coin quilt, I decided to use this as the basis for my rainbow quilt. 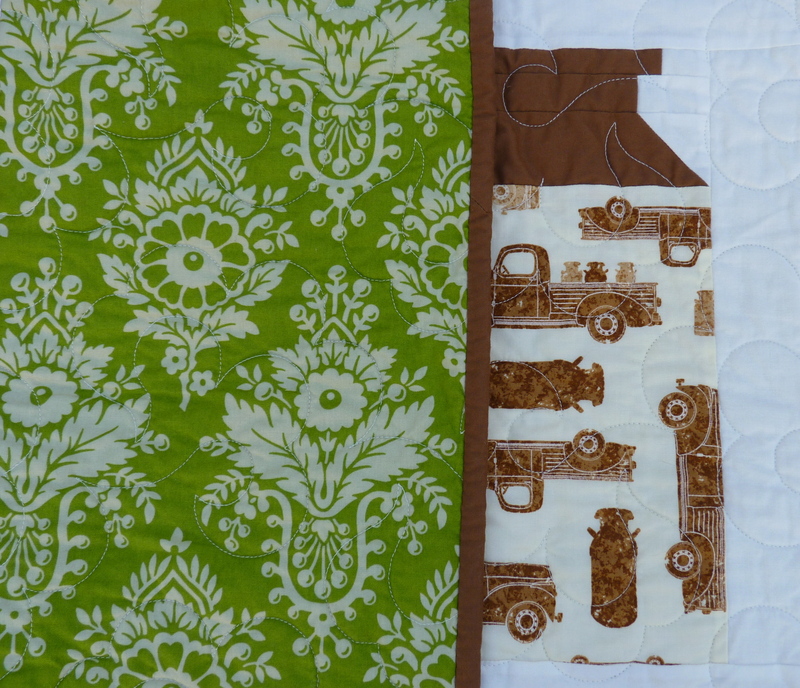 For this quilt, I used a jelly roll and simply removed any duplicate fabric strips. The fabrics were used in the same order they were presented in the jelly roll and the same design was used across a row in each of the five columns. A Flurry spot (Dashwood studios) in light teal was the perfect choice for the background. I had no dilemmas about what to use for the backing fabric. It just had to be unicorns. 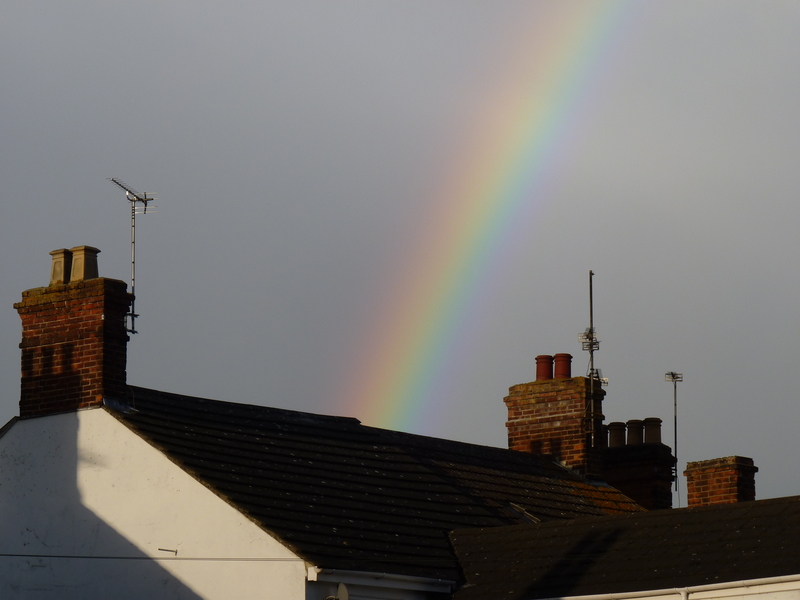 I mean, what else would you expect to find behind a rainbow? Visitors to my Bucks Open Studios event were asked to help me choose which unicorn fabric to use. It was an even split between the green and the purple colour ways of this lovely whimsical design by Heather Ross from her Far Far Away collection. In the end, the decision was taken out of my hands as I could only source enough of the green colour way to complete the backing. Either one would have worked however the green is a beautiful, soothing colour that is the perfect counterfoil for the riot of colours on the front. The lovely, swirly Curlz (it’s my favourite) was used as the quilting design and a glorious sunshine yellow from the Linen Cupboard collection was chosen for the binding. This cuddly, warm quilt in cheerful, sunny colours cannot fail to banish dark days and rainy skies. 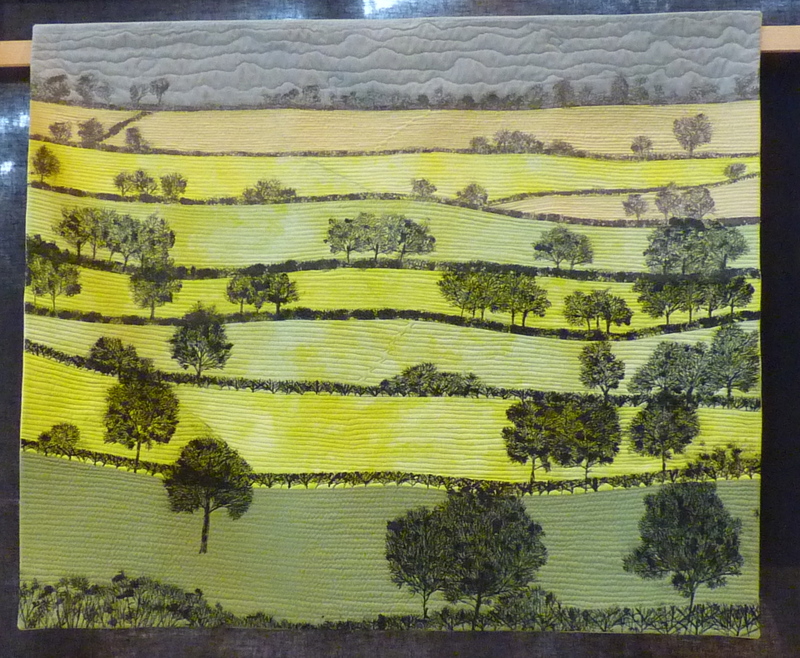 On Sunday I made the journey to Birmingham (UK) for the Festival of Quilts. It was almost overwhelming seeing so many gorgeous quilts on display (not to mention the shopping opportunities – but more on that at another time). Rather than give an overview of the show, I thought I would share some of my favourite quilts. They may not have been THE prize-winning quilts however they were all winners in my book. I loved the calm serenity of this quilt from the pictorial quilts section. The sunny outlook and bright colours of this pictorial quilt I found very appealing. You could find something new in this quilt each time you looked at it. 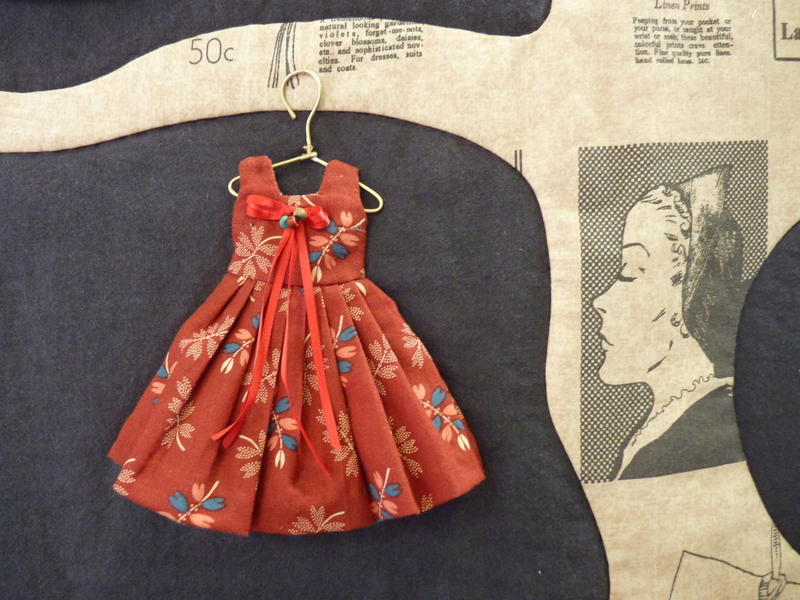 This close-up shows the amazing detail – all done a small domestic sewing machine. Respect! 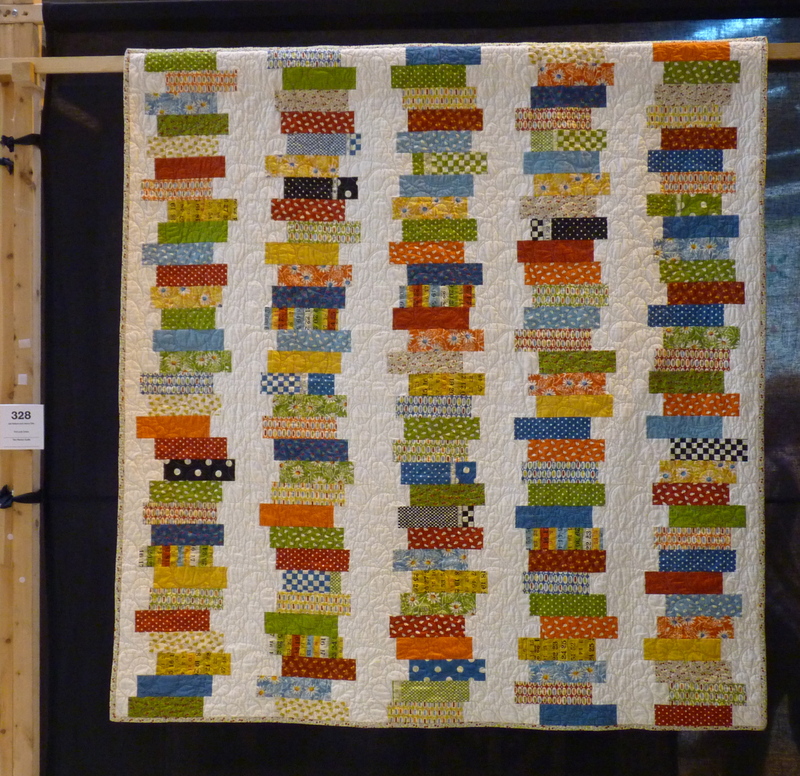 Here is one of my favourites from the contemporary quilt section. A quilt covered in little dresses. So cute! And I loved the hats and shoes quilted in the background. Can never have enough of those. This quilt by Andy Brunhammer from the Art Quilt Category looked fairly nondescript until you looked at it through a camera. Suddenly, the image revealed itself as the face of a sleeping woman (Bette Davis, no less). How is this effect achieved? I have no idea although it has “something to do with pixels”. 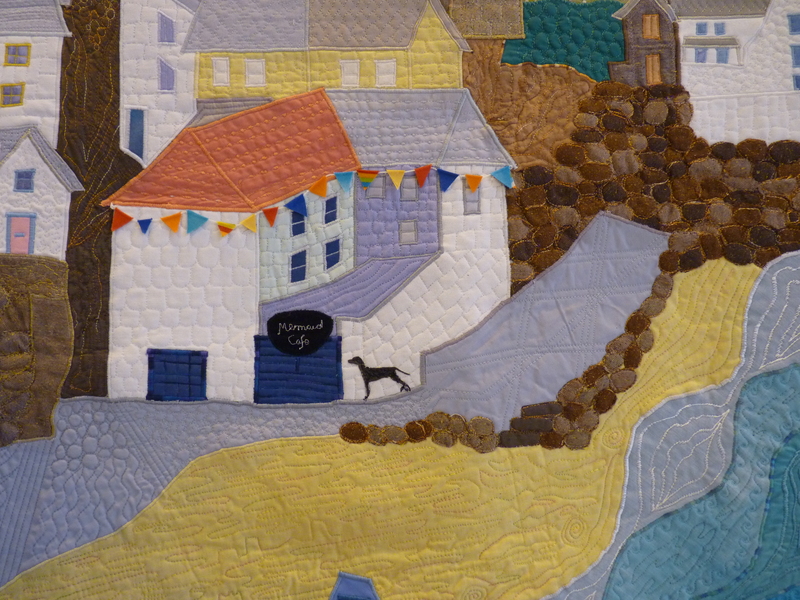 I loved this tiny quilt by Joanna O’Neill. It reminded me of the seven basic plot outlines – wo/man against something/someone, rags to riches, a quest and so on. It is now difficult to think of a book that would not be improved by the addition of at least one cat. As lovely as these quilts were, I still prefer a quilt that can be used as more than a decorative piece. I like quilts that keep you warm at night, share your picnic and that you can hide under during the scary bits in Dr Who (I still have nightmares about those statues!). 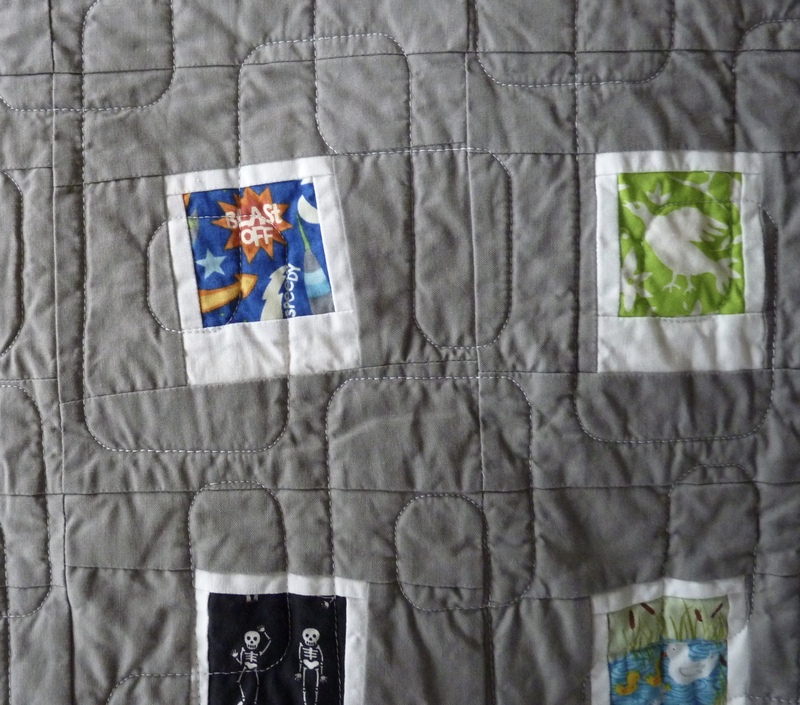 This scrappy quilt, in which “no yardage was harmed in the making” was a delight. Such a glorious collection of colours. I also loved the blues and metallic gold fabrics used in this traditional sampler quilt. Can you believe it was her first quilt? And this one with a simple but very effective design of squares and half-square triangles. 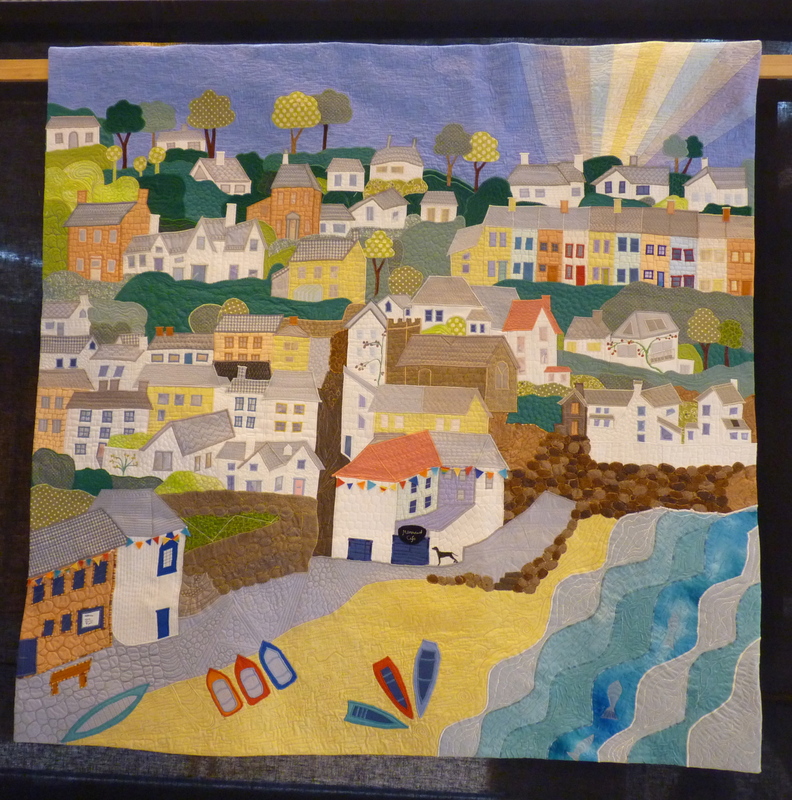 Any of you who follow my Facebook page will have seen that I also entered a quilt in this year’s show. Here it is on display. And I received some very nice comments from the judges too. All in all, a great day out.